Dynamic Real Estate Agents need an assistant! You know that hiring a Real Estate Virtual Assistant (REVA) has many advantages. The concept is relatively simple: instead of hiring in-house employees to handle your necessary but non-core, transaction-based functions, hire a cheaper and more efficient offshore assistant. But where do you start? Don’t worry, Global OfficeWorks is your solution! But, remember: Hiring a REVA is not like dropping off your dirty clothes at the dry cleaner and having them magically transform into fresh-pressed garments the next day. You need to play an active role to make the engagement successful. However, that doesn’t always happen. So, what are the most common missteps that cause potentially great REVA relationships to fail? Here are some of the biggest pitfalls – as well as the best ways to manage a successful relationship with your REVA. Yes, it’s a competitive market, with both freelance REVA’s and other Virtual Assistant companies making a lot of promises. But, if the price is far below market, buyer-beware. There are a lot of educated people online who claim capabilities at a low-ball price. Without due diligence, the result can be a disaster. Don’t rely on marketing pitches or price alone to choose your partner. Talk to references, interview management and always evaluate your risk. Ask yourself what happens if your REVA just disappears? Choose a company which has western ownership and management in place. Make sure your REVA can adapt to your business practices. When you’re interviewing your choices, ask about how each vendor addresses employee stability. What systems are in place to discourage attrition and replacing your REVA in the event they do quit. Hiring a REVA is a procurement decision, right? You select a REVA and execute the contract. No need to make a big production out of it. If you are not committed to the partnership, things could head south fast. You need to manage your Virtual employees the same way you manage any other employee. This includes training them in your business practices. When you hire someone to clean your house, that person typically does the job faster and better than you can yourself – and get rid of that spot or stain that, try as you might, you never really could. That’s not a surprise. Cleaning professionals have their own techniques, tools and probably tried something you didn’t on that stain. After all, they are professionals. When you hire a REVA, you want to increase efficiency and probably take care of one or two problem areas. But, if you’re resistant to trying a new way of solving that problem, you’re blocking the path to resolution. It’s essential that you are open to new solutions and approaches. Your REVA might suggest you try something new or innovative. If you’re going to succeed, you need to be open to these new approaches to old problems. In other words, use your REVA’s expertise to help you succeed. You have decided to hire a REVA and want to realize the benefits of your REVA as quickly as possible. However, rushing into it can often cause setbacks. It is essential for real estate agents like you to get the first step right. You need to hire the right person and take time to train them. Choose a company with a stringent orientation and testing program so they make sure the REVA you hire is perfectly suited to you. Plan more time for this recruitment and training step and your patience will be rewarded with greater long-term returns. This is the biggest mistake of all: lack of partnership. If you approach your REVA with the words “us” and “them,” you’re probably doomed to failure. If you want it to work out, you’ve got to make a commitment – in a big way. Take that route, and you may just fall in love with the results – and discover the real virtues of working with your REVA as other real estate agents did. 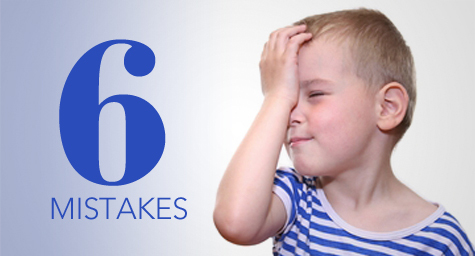 I mean Real Estate Agents Commit 6 Mistakes is a little boring. type of informative sites in top of the list. Generally the top sites are full of garbage.